The major, the finest, poets of Victorian England were Alfred, Lord Tennyson, Robert Browning, Matthew Arnold, and Gerard Manley Hopkins. Yet Hopkins was almost unknown until 1918 when his book Poems was first published, as edited by his friend Robert Bridges, then Poet Laureate. Born on July 28, 1844, in the London suburb of Stratford, Essex, Gerard Hopkins grew up in London’s Hampstead, among a comfortable family talented in word, art, and music. In 1863 he went up to Oxford where he did brilliantly and anguished over religion. 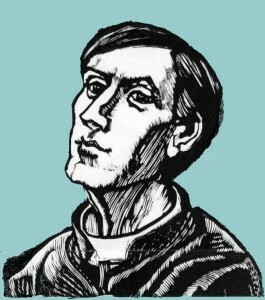 With the counsel of John Henry Newman, he was received into the Roman Catholic Church on October 21,1866, and after finishing Oxford in 1867, he taught for some months at Newman’s Oratory School near Birmingham. In 1884 Hopkins went to Dublin as Professor of Greek at University College and examiner in the Royal Univeristy. But on Stephen’s Green, his chronic depression was magnified by bad eyesight, political irritation, spiritual desolation, and exhaustion from grading hundreds of examination papers. In 1885-86 he wrote seven sonnets, the “Terrible Sonnets” or “Dark Sonnets,” which scream with pain amid technical perfection. But other poems express patience, even jubiliant hope in Christ, though his final poem describes a “winter world ” in which his “sweet fire” of poetic inspiration has waned. A few weeks later, on June 8,1889, he died, a victim of typhoid fever. Hopkins’ poems, first published in 1918, grew into fame after the second edition of 1930. Hailed as experimental and strikingly modern, they display rich music, novel rhythms, clustered words, craggy strength, and poetic power. Later, Hopkins had distinguished followers: notably such important modern poets as W.H.Auden, Robert Lowell, Sylvia Plath, David Jones, Dylan Thomas, and Seamus Heaney. The Hopkins Sketch is based on a Woodblock by Robert F. McGovern and reproduced with his kind permission.